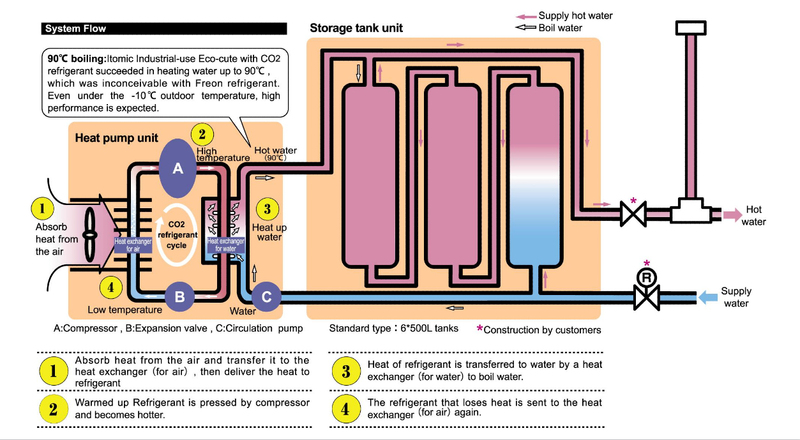 Highly efficient CO2 heat pump water heater. ITOMIC Industrial use Eco-cute introduces CO2 Heat pump system which utilizes heat from the air and produces heat energy to make hot water. 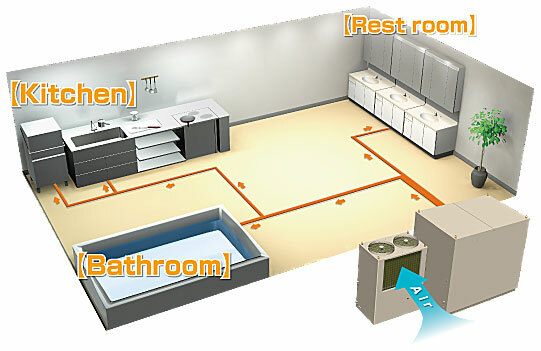 1electrical energy can produce 3.8 heating energy. (*COP=3.8) Its high efficiency leads to lower running cost and being eco-friendly. *COP (Coefficient of Performance) is the ratio of heat delivered by the heat pump and the electricity supplied to the compressor. The bigger the figure, the better the efficiency. Eco-friendly and the best way to reduce CO2 emissions. Ozone Depleting coefficient is 0. 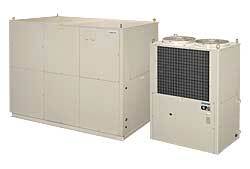 Global Warming Potential is 1/1700 of Freon refrigerant. Stopping the Global Warming is one of our top priorities. Itomic Eco-cute uses naturally abundant CO2(R744) as refrigerant, so "Ozone Depleting Coefficient is 0, Global Warming Potential is 0" is realized. 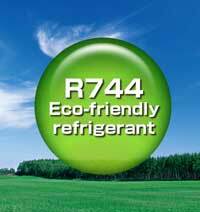 CO2 refrigerant is not combustible nor toxic, which makes our Eco-cute next generation type water heater. These values are based on our estimation. ODP=Ozone Depletion Potential,GWP=Global Warming Potential. Suitable usage ...Washing, shower, bath.